The first attempt at charcuterie… a delightful success! Pancetta is cured pork belly, the Italian equivalent of bacon. Unlike American bacon, however, pancetta is cured with a variety of herbs, spices, and garlic, and is left unsmoked. With the help of Karen Aboussie of Savory Spice Shop, we walked away with all the spices we needed… including the insanely hard-to-find curing salt. Place the pork belly meat side up. Using a sharp boning knife, make the piece more level by trimming off any extra bits of muscle or fat. Square off the edges with a chef’s knife. Keep cutting until the skin is completely removed, then use your knife to even out the fat layer a little. Place the 2 tablespoons of peppercorns and the juniper berries on a rimmed baking sheet. Use a heavy pot to crush them. Combine them in a mixing bowl with the rest of the cure ingredients. Mix the cure very well to evenly distribute the ingredients. Refrigerate the weighted belly for 7 days, flipping it over every day. After 7 days, remove the belly from the refrigerator and press down on it to check the firmness. It should feel uniformly firm throughout, as if you’re pressing down on a soccer ball. If the belly is still squishy like raw meat, return it to the refrigerator for up to 3 more days. Move the pork to a clean cutting board and pat it very dry with paper towels. Place it meat side up. 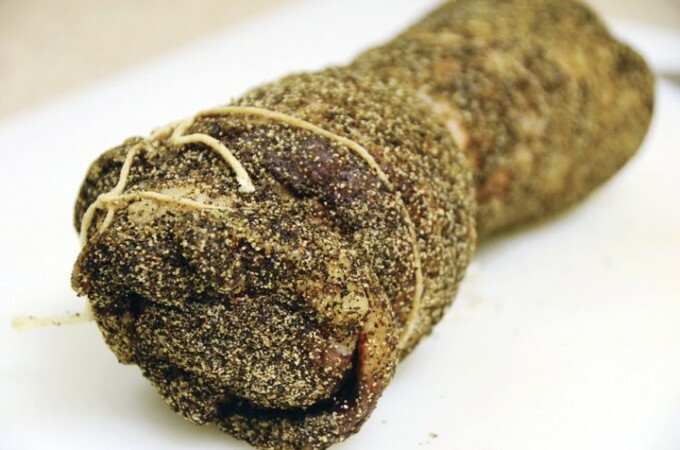 Crush the remaining tablespoon of black peppercorns with a heavy pot and rub the crushed pepper over all the meat sides to create an even coating. Roll the pork belly very, very tightly into a cylindrical shape, starting at whichever end makes the roll most uniform. Make sure there are no air pockets inside the pancetta. Tie it very tightly with butcher’s twine at 1- to 1-1/2-inch intervals. Be sure to leave enough extra twine to hang the pancetta with. Hang the pancetta in a slightly cool, dark, moderately humid place where air can circulate freely around it. (Ideal conditions are around 60°F and around 60 percent humidity.) Keep it out of direct sunlight and away from air vents. A basement is ideal, as is a bathroom that isn’t used often (a shower curtain rod works great for hanging, but not if you’re showering in there!). We hung ours both next to the kitchen sink and in the bathroom, and we never had one pancetta go bad. Let the pancetta hang for 2 weeks. It will emit a subtle smell, sort of savory and sweet like the cure. If it smells rancid or rotten, take it down and trash it. When the pancetta is completely firm but pliable like leather, it’s ready. Cut down the pancetta and wrap it tightly in plastic wrap. Store it in the refrigerator for 2 to 3 weeks, or in the freezer for up to 4 months.